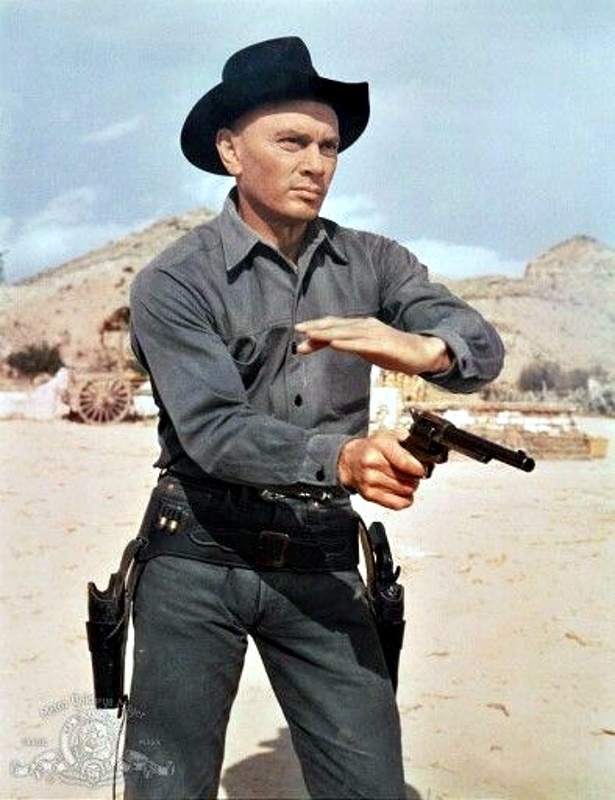 Yul Brynner’s Gunslinger is a copy (heh) of his The Magnificent Seven (1960) character, Chris Larabee Adams; coincidentally that film was also remade in 2016, with Denzel Washington in Brynner’s (renamed) role. 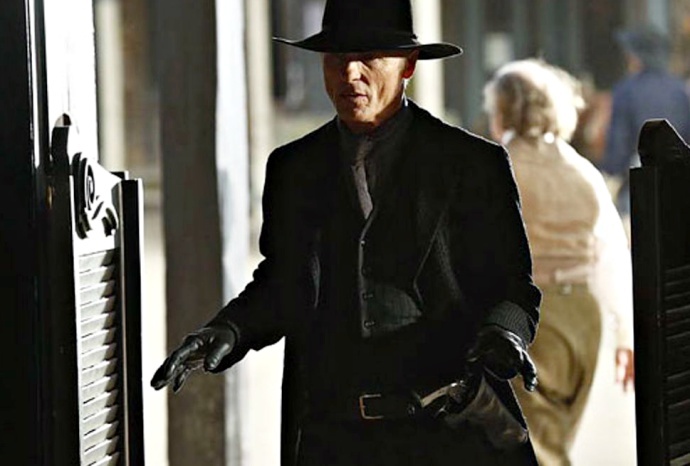 This may also remind you of Matthew McConaughey’s Man in Black, who’ll antagonize Idris Elba’s Roland Deschain, aka The Gunslinger … but that’s a whole other story. 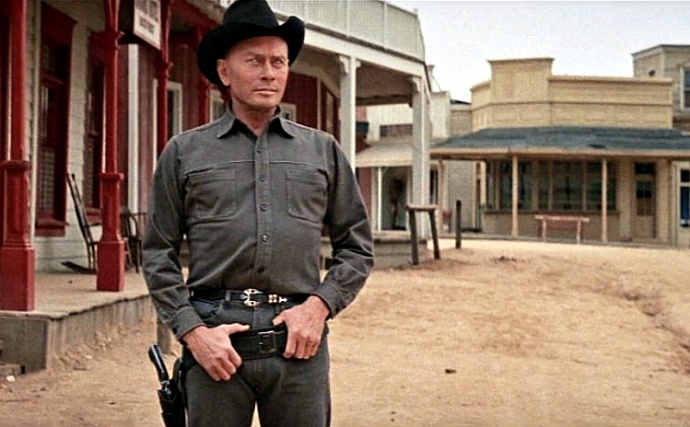 Both Arnold Schwarzenegger (as the Terminator) and director John Carpenter (Halloween‘s Michael Myers) were so inspired by Yul Brynner’s Gunslinger that their characters were modeled on him. You might notice (especially in the header picture) a particular glow in the Gunslinger’s eyes (Cylon red spine, anyone?). 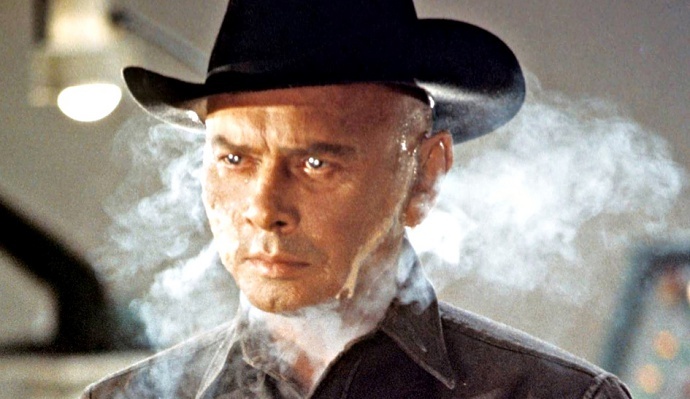 That is no digital effect; Brynner wore mirrored (light reflecting) contact lenses. Well, until the time he got hit in one eye by a piece of a blank cartridge, which put off some of his scenes for a while. Alka-Seltzer and a splash of water provided the acid fizz. I’d visited Kennedy Space Center and seen how astronauts were being trained – and I realized that they were really being trained to be machines. Those guys were working very hard to make their responses and even their heartbeats, as machine-like and predictable as possible. At the other extreme, one can go to Disneyland and see Abraham Lincoln standing up every 15 minutes to deliver the Gettysburg Address. That’s the case of a machine that has been made to look, talk and act like a person. I think it was the sort of notion that got the picture started. 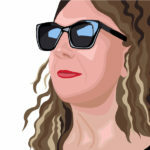 It was the idea of playing with a situation in which the usual distinctions between person and machine – between a car and the driver of the car – become blurred, and then trying to see if there was something in the situation that would lead to other ways of looking at what’s human and what’s mechanical. As happened with Jurassic Park, some fools decided reopening Delos after the disastrous Westworld events would be a fine idea, and the less well-received sequel, Futureworld, resurrected Brynner’s Gunslinger for a dream sequence. That was Brynner’s second-to-last ever film appearance. While Westworld was the first movie to use CGI effects (for the Gunslinger’s POV), Futureworld was the first with 3-D CGI. To obtain that Westworld footage, actor Richard Benjamin was completely whited out — as in clothes, skin, hair — and filmed; the resulting highly contrasted footage was converted into a mosaic pattern that displayed what viewers saw through the Gunslinger’s electronic eyes. A chap by the name of John Whitney, Jr., has devised an ingenious method of taking original camera footage and converting the image into a fascinating mosaic pattern of varying shapes and colors. The trick here is to provide original camera footage which contains sufficient “contrast” to produce a good computer facsimile. We made tests of certain key sequences to arrive at a contrast that would be suitable. For example. we had Richard Benjamin made up completely in white – white make-up, a white western wardrobe, complete with white gloves, and white hair spray. He looked as though he had fallen into a barrel of flour! But that is the kind of contrast that seemed to work best for us on this particular sequence. Other shots (exteriors) were put through the computer to achieve a similar effect. The visual effect really ‘set up the audience’ for a believable robot gunslinger P.O.V. Michael Crichton’s film is reportedly the first mention of a “computer virus;” self-replicating programs made their appearance in the early 1970s. One of Westworld’s first lines is: “Nothing can go wrong.” I’m looking for that to make an appearance during Sunday’s premiere. Next story When Will Your Favorite TV Series Return and Which New Shows Should You Keep an Eye Out For? Previous story Outlander Finds Its Grown-Up Fergus!